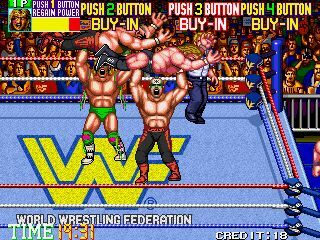 About a year ago I wrote an article on this blog about my experience discovering and then purchasing my favorite video game ever; the WWF Wrestlefest arcade game (check it out here: Tales from the Toy Chest: The Wrangling of Wrestlefest). Since then I began to analyze the game more and more. I wanted to understand it. Searching the internet for more information, I realized there wasn’t much out there. Sure, there was a lot of reviews about how awesome it was and who was in it. But there was very little on the actual gameplay and strategy behind it. What wrestler was better at what? Who did more damage? What moves did they perform? And were there any cheats? Like always, when these questions and thoughts hit my head, it gets my creative juices and OCD flowing. And that, my friends, is what this write-up is all about. Every single thing you could ever want to know about the WWF Wrestlefest arcade game. Yup, another exhaustive and extensive analysis by yours truly on the greatest wrestling video game the world ever produced. And that's saying a lot since this game hit the arcades in the summer of 1991 so you could say that I'm writing this article a few years too late. But what the hell, I just bought the cabinet a few years ago so it's new and fresh to me. Who knows, maybe you were waiting for something like this to come out? Maybe you weren’t. But either way you know it’s going to be good and a ton of fun. BOOM!!! Q. Was WWF Wrestlefest the successor to WWF Superstars? A. Yes. 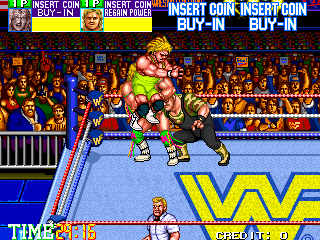 WWF Superstars came to arcades in the summer of 1989 by Technos. 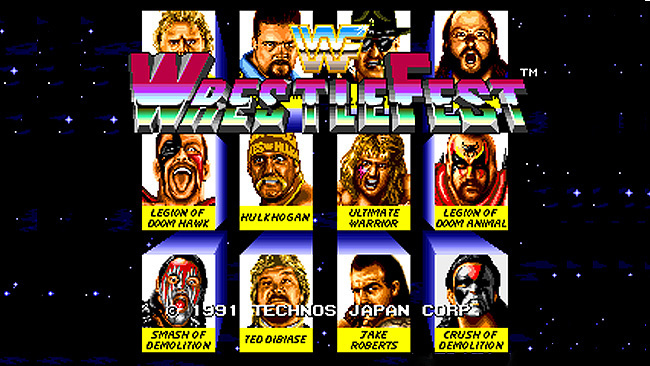 They expanded the roster and gameplay to unprecedented heights two years later with Wrestlefest. Q. How come Technos stopped making WWF arcade games after Wrestlefest in 1991? 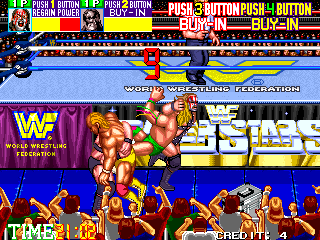 A. Technos only had the rights to make WWF games for the arcade, which is the reason the game never got released on a home port. They lost the rights shortly after Wrestlfest was produced. 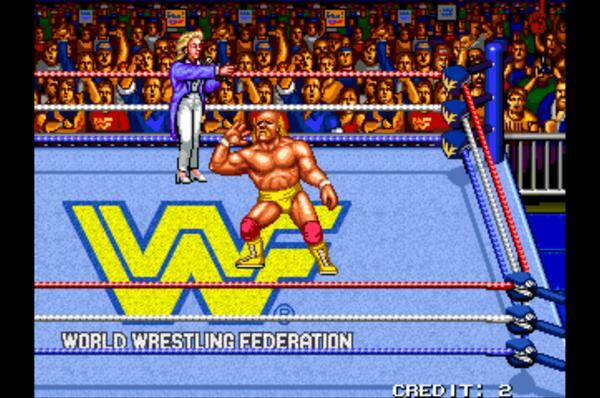 Acclaim had the exclusive rights to make WWF video games for consoles while Ocean Software had the rights to make WWF video games for home computers. Q. Was an updated version of Wrestlefest made? A. Yes, on February 21, 2012 THQ released a remake of this game on the iOS featuring both current and former wrestlers, retitled WWE WrestleFest and the less I talk about this the better. Only the Technos 1991 arcade classic is what I care about and what I’m talking about in this write-up. I absolutely HATED wrestling after 1992 and never really followed it ever again. Q. I know Wrestlefest was a conversion kit for other machines. But was it also sold as an original cabinet? A. Yes, it came as a dedicated Technos cabinet and they are pretty rare to find. Q. Why is it sometimes I play 4 matches before getting to the Legion of Doom, and sometimes 5? A. There is a modifiable dipswitch in the arcade cabinet which the owner can change. Those of you who have RAINE (see last question for more info on that) are able to change this manually. For you techies who like this sort of thing, it's the first switch of Dipswitch B (11h). Q. 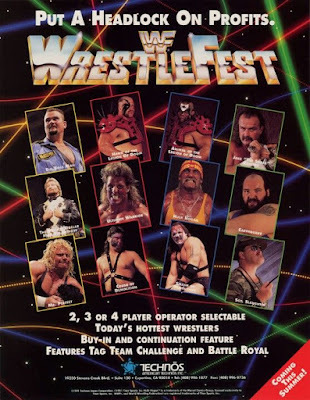 When was Wrestlefest made? A. Demolition consists of Smash and Crush on this roster, and THAT combination didn't last very long. Judging by the fact that Mr. Perfect is still here and at the same time as Sgt. Slaughter, I would presume that the Ultimate Warrior is the WWF Champion and this is set just after WrestleMania VI and just before Summer Slam of that year -- summer 1990. Q. Why was Randy Savage not included on the roster? A. Sadly, during the making of this game he was in semi-retirement. What is even more upsetting is that when this game hit the public in the summer of 1991 he was back in action and a full-time wrestler once again. Q. Can I pick Demolition individually and make them team up with another wrestler? A. No. You can only pick them as a team. You can use them individually only in the Royal Rumble mode. Q. How do you taunt? A. You can't. Only the CPU is capable of doing this. Q. Can you pick the Legion of Doom/Road Warriors? A. Yes you can, but there are a few problems. See below in SECTION 3. Q. I always hear you can play Wrestlefest on your computer with a MAME, RAINE and ROM but what are those? A. MAME and RAINE are video game emulators that are programs that simulates the inner-workings of a video game console (ex. Nintendo 64, Sega Genesis, etc.). A "ROM" is a file that contains all the information from a video game cartridge for an individual game. Therefore, if you wanted to play Sonic the Hedgehog, you would need a Sega Genesis emulator, and a Sonic the Hedgehog ROM to use in conjunction with it. MAME and RAINE are two popular Arcade machine emulators. They are able to emulate numerous numbers of games due to each arcade game having "drivers" which work kind of like individual emulators within the emulators -- but you don't need to worry about drivers. All you need for MAME is the emulator, and the game. Arcade games have several individual ROMS which are included in the zip files you find online -- but YOU DO NOT NEED TO UNZIP THE ZIP FILE when you get it. Just place the zip file in the "Roms" folder in the MAME directory and run MAME, and it should detect it automatically. More information on this can be found online, so look there. Wrestlers' finishers are in BOLD BLOCK CAPS. 1. The opponent breaks out of it and knocking you down. 2. The move is broken up by outside interference, which will knock you down. 3. All the opponent's energy is drained, causing a submission and a win. There are two prone positions: horizontal and diagonal. When your opponent lies diagonally they are nearing the end of their energy bar. Each wrestler has four grapple moves which are performed two at a time in rotation. For example; when starting on a fresh wrestler Hulk Hogan will do a Body Slam followed by a Snap Mare until their energy reaches a certain level. Then he will switch between an Atomic Drop and a Suplex. This does not always apply to the CPU, and the rotation can change in a Royal Rumble match as well. "Whatcha gonna do when Hulkamania runs wild on YOU?" Although most of his moves are basic, the Immortal Hulkster is a devastating opponent capable of a great offense with big damage. He is one of only two wrestlers in the game that has a combo-finisher (the other is the Ultimate Warrior); his Big Boot/Legdrop can cripple opponents and carry him to victory. As the face of the WWF it should be no surprise that he can take a ton of damage and excel at either the tag-team or Royal Rumble modes. 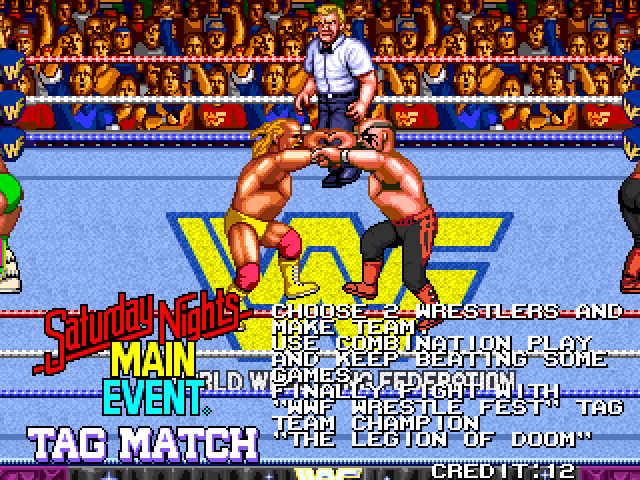 Saturday Nights Main Event Tag-Team Match: How could you go wrong with having Hulkamania on your side? Hogan is easily one of the best tag-team partners you can have in the game. Royal Rumble: The Hulkster is a true force in this match. His Big Boot move can be devastating to all the groups of wrestlers in front of him. There's not many wrestlers with as much finesse as Mr. Perfect. His finisher; The Perfect-plex, doesn’t do much in terms of damage but he’s able to execute it early on in the match. He also makes up of his lack of damage potential by being the fastest/quickest wrestler in the game. Saturday Nights Main Event Tag-Team Match: Mr. Perfect is a tag-team master. His quickness/speed to tag in and out and to cover the distance of the ring when he’s hurt is second to none. This makes him an absolutely "perfect” partner. Royal Rumble: Mr. Perfect is a little less “perfect” in the Royal Rumbles due to not having a Body Slam move to throw out healthy opponents when near the ropes. He must rely on his speed and Back Body Drop to eliminate the opposition so most of the time he will have to do it the old-fashion way; by pinning or submitting his opponent. But his Running Dropkick maneuver is very useful due to its range and ability to knock down more than one opponent which can be extremely useful when wrestlers tend to bunch up in the Rumble match. Jake is more of a cerebral wrestler to use in this game. A little strategy and cunning can go a long way to see his true potential. Although he is very average when matching up against the other heavy-hitters, his finishing DDT maneuver easily ranks as one of the most devastating. Late in the game this will surely even the odds in your favor if you can hit an opponent with it. Saturday Nights Main Event Tag-Team Match: Jake is a solid partner and his DDT finisher is a big asset to any team he's on. Royal Rumble: Jake is probably better suited for the Rumble match than in a tag-team match due to the fact that he can hit his DDT on opponents getting fatigued to eliminate them quickly soon after. "You're gonna feel a living earthquake!" There is no denying the fun and power of Earthquake in this game. He can take a ton of punishment and cause tremendous damage with his move-set and Vertical Splash finisher. But by being the biggest and heaviest cat in the game, he's also the slowest. Saturday Nights Main Event Tag-Team Match: Being very slow tends to give Earthquake a slight disadvantage in a tag-team match. But after you hit his finisher on a downed opponent, you won’t care. Royal Rumble: Earthquake, as you expect, excels in a Rumble match. His damage potential, Body Slam and finisher do the job every time. Also his Bear Hug is key to getting a quick submission elimination to an already fatigued opponent when they come his way. "Drop and give me 20 you maggots!" Slaughter is a very crafty and skilled wrestler with one hell of a mean streak. But where Technos came up with his finisher, I'll never know. For one thing, he doesn't call it the Cobra Clutch (Slaughter is supposed to do a CAMEL Clutch) and the move he demonstrates in this game ISN'T a Cobra Clutch anyway (Ted DiBiase' finisher, The Million Dollar Dream is a Cobra Clutch). The move he does seems to be a temple-grinding-noogie submission maneuver??? Even with all that, his so-called “Cobra Clutch” still doesn’t do much in terms of damage. It’s his Chestbreaker move that causes his opponents to quiver in pain and "Atten-hut." Saturday Nights Main Event Tag-Team Match: Being a little slower than the other wrestlers tends to hinder Slaughter a in a tag-team match. Royal Rumble: As a big man Slaughter is very capable in the Rumble match. He can use his Body Slam early on to eliminate fresh wrestlers and sneak attack a downed wrestler and apply his Cobra Clutch finisher on them. Just make sure they are really hurt or they will break free and you will be the one laying on the mat when they escape. A superb wrestler that is tremendously well-rounded. Full of technical and brawling knowledge, DiBiase's only problem is what to use next. Be a little careful when slapping The Million Dollar Dream on an opponent as it doesn’t do much damage. Saturday Nights Main Event Tag-Team Match: DiBiase is well suited for the tag-team match due to his speed, move-set and ring generalship. He’s a master in this match plain and simple. Royal Rumble: Dibiase suffers in this match from not having a Body Slam move to get a quick elimination early in the match when near the ropes. Most of his eliminations will come by using his Back Drop in the chaos when opponents are running at him. DiBiase most likely needs to submit or pin his opponent to get to victory. "Feel the power of the Ultimate Woooryahhh!" The Ultimate Warrior is sheer force in the ring, and can be literally unstoppable. He has the ability to occasionally “no-sell” other wrestlers moves and even finishers by just getting up after taking a big hit (and damage) making his ability to recover absolutely extraordinary. Other than Hulk Hogan, he is the only other wrestler in the game capable of a combo-finisher; his Gorilla Press/Warrior Splash can cripple the opposition. This guy is ferocity personified and totally indomitable in Wrestlefest. Saturday Nights Main Event Tag-Team Match: The consummate tag-team partner due to his damage, speed and recovery. Royal Rumble: All his moves and abilities are geared for the chaos that comes with this type of match. "You're gonna serve hard time, punk!" Given a low profile in this game against the other big names The Big Boss Man is far more fearsome than this suggests. As the “second” biggest guy in the game, Boss Man doesn’t suffer from the same penalties that the slow moving Earthquake does. Plus he benefits from a lot of grapple moves that can really put the hurting on opponents when in close. Saturday Nights Main Event Tag-Team Match: Boss Man makes a great partner who can help keep opponents close to his corner especially with his Boss Man Slam finisher. Yes, he’s slower than most but even so, it’s not by much. Royal Rumble: Boss Man can rule the Royal Rumble and is second to no one in this match. While he’s able to toss opponents out early, he can also surprise many of them with a well timed Boss Man Slam. And the scary part is he can manage it over and over on several fatigued opponents running towards him. It can be pretty devastating so be careful when facing him. "I'm gonna kick your stinkin' teeth in!" Smash is possibly the most generic wrestler in the game. All his moves are basic, so basic in fact that his finishing move is -- The Suplex?! Yup, you read that right. And why can't Demolition do their double-team move in this game? Ah, such is life. But the great thing about Smash is the consistent high damage output he produces and that he excels in both Tag-Team and Royal Rumble matches. Saturday Nights Main Event Tag-Team Match: They are Demolition… nuff said. Royal Rumble: Smash is equally effective in this mode as well. Crush is a seriously strong hombre that can match up with the best of them. He has a much more spectacular finisher than his partner Smash, which also does some major damage. And just like his tag-team partner, Crush is well-suited for both the Tag-Team and Royal Rumble matches. Royal Rumble: Crush is equally effective in this mode as well. "Mean" Gene Okerlund : "It's time to fight with a powerful challenge." Road Warrior Animal : "Hehaha! We snack on danger, dine on death!" Road Warrior Hawk : "To bury every gerbil-faced geek we face. Raaaaaah!" 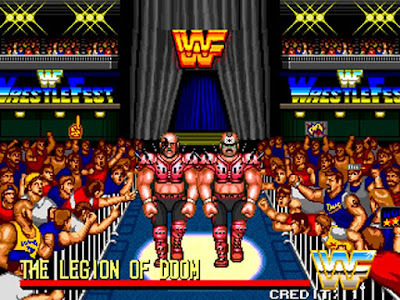 The Legion of Doom are without a doubt the boss of bosses in Wrestlefest. They are the undisputed tag-team champions that can perform the most devastating finisher in the game “THE DOOMSDAY DEVICE!” If you get hit by this start paying or praying because it’s basically a wrap. As individuals they function much differently than the other wrestlers. They have more of an arsenal of wrestling maneuvers, more health (approximately 2.5 longer than normal energy), they do more damage, they recover quicker and they are able to perform their high-damage power moves early on in the match. 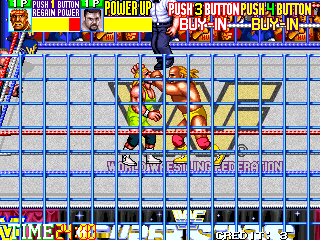 While they are not playable characters in the arcade, they can be if you possess RAINE, the Wrestlefest ROM with a couple of drawbacks (see below). It seems to me that they WERE intended to be selectable as they have unfinished portraits. But they must have been pulled later on. Why, Tecmos, why? Name and Info are irrelevant to the Computer, so put anything helpful to you. 'Name' is what the cheat will be called in the list, so name it whatever you like. Edit the fields with the addr(ess) and data given from the list. 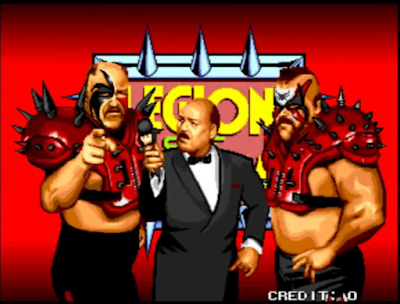 *Here the Legion of Doom are selectable wrestlers! Check out how you can use them effectively below -- "What a Rush!" Animal is simply the strongest character in the game and possibly the most fearsome single opponent you can face. The damage he can dish out is almost unfair. Saturday Nights Main Event Tag-Team Match: One-half of the WWF Wrestlefest Tag-Team Champions of the World! What more do you need to know? Beware of Animal's "Hoist" (the set-up to The Doomsday Device) -- if you are positioned incorrectly Hawk will not jump and you will effectively have to reset the game. Animal will keep the opponent on his shoulders indefinitely. Royal Rumble: First thing you need to know is that in this match you can relax and have no fear of Animal using his "Hoist" move. And that's a BIG problem for everyone else because Animal is without a doubt the KING of the Royal Rumble! Using him as a playable character really gives you a massive edge over all your opponents. What makes him so special is that Animal will only perform his Body Slam maneuver against full-health opponents when near the ropes which makes tossing them out an easy task. Get to wrestlers before they become fatigued, win the lock up, get them in a headlock, drag them towards the ropes and throw them out. Rinse and repeat. There’s no telling how many opponents you will end up tossing out before the match is through. Animal can also Gorilla Press an opponent out of the ring when other wrestlers are getting hurt. Of course there is no guarantee you will always win such a chaotic match, but the odds are always in Animal’s favor. While Hawk lacks a little of the overall power that Animal possesses, he makes up for it in speed and arsenal. Nobody in the game has such an array of moves that are geared to knock down clusters of wrestlers at any time. He's simply a wrecking ball of terror. And when using Hawk, you can pound on the opposition as long as you like not being fearful of “hoisting” your opponent for The Doomsday Device like Animal does. So enjoy the carnage. Saturday Nights Main Event Tag-Team Match: One-half of the WWF Wrestlefest Tag-Team Champions of the World! Hawk is actually slightly better than Animal in this mode due to his greater speed. Royal Rumble: While Hawk ranks second to Animal in this match (only because he will sometimes randomly do a Standing Dropkick before a Body Slam when near the ropes with a healthy opponent), he is absolutely devastating against the clumps of wrestlers in front of him. Use his Flying Dropkick or Flying Clothesline effectively and watch the bodies fly. 1. After the Restrain move (K from behind), your partner (in tag mode) will be allowed in and can kick or punch the opponent. 2. When the opponent is in a headlock (P in grapple), you are free to drag them about. If you roam over to your corner and tag (P or K), your partner will leap from the turnbuckle and smash 'em over the head. This also allows both wrestlers in the ring for a brief period. 4. If you are playing with another player on the same team, you can still Punch and Restrain an opponent even if you are on the outside of the ring. Simply press (P or K) when an opponent is near you. Be careful because this can happen to you if you are too close to your opponents corner. 5. Be aware when you are in the ring and double-teaming your opponent because your Punches, Kicks, Clotheslines and (some) moves can hurt your partner. With a quick Body Slam, Back Body Drop or Animal's Gorilla Press you can throw your opponent out of the ring. Here, your moves will do more damage than usual. There are also metal steps and video monitors up for grabs, both of which do BIG damage. If your opponent stays in the ring, take the opportunity to double-team his partner. Let your mate do the grappling, and just when the other guy gets up, lay the Smack down with a foreign object. Beware however, as the CPU will always grab an object if he is standing over it. And make sure you keep track of the time because you have only a 20 count to get back into the ring. As soon as both of you are back inside the ring, the ring is reset, as if nobody had been outside. You are even plucked from the top rope if you were contemplating to jump from it. A great tactic is to climb the top rope immediately after hurling someone outside. If you leap at the earliest possible moment, they will stand still awaiting your Turnbuckle attack! "Choose 2 wrestlers and make team. Use combination play and keep beating some games. Finally fight with ‘WWF Wrestle fest’ champion 'The Legion of Doom'." There is no easy technique to get you through this part of the game, but it helps to rely on double-teaming and fast tags -- energy regenerates quickly for the partner outside of the ring. Whenever possible throw the CPU scum out of the ring for double-teaming malarkey. Watch for the words "POWER UP" in the illegal man's energy bar -- this means that they will win every grapple and inflict double damage. Tag them in as soon as possible; they will shake the ropes to alert you to this fact. Going outside of the ring loses the POWER UP advantage. When fighting inside a steel cage there really isn't that much of a difference than fighting in a regular match. The exceptions being that you cannot throw another wrestler out of the ring. When you Irish Whip a wrestler into the ropes he will clang off the cage instead of rebounding back towards you. The Legion of Doom are seriously deadly opponents and it helps to try to beat them by count out rather than pin. Regardless, have your quarters ready and by god, watch out for the Doomsday Device. Ways to win: Pin, Submission, or opponent is counted out of the ring. The Royal Rumble has a simple flaw which is exploitable with anyone except Ted DiBiase and Mr Perfect. Right at the start or for any fresh wrestlers, grab and smack 'em in a headlock. Walk them to the nearest ropes. When you reach them, turn around and press a button. This will send them soaring over the ropes with a Body Slam (this is why the two mentioned above cannot do it -- they do not have a Body Slam)! Do not be put off if they Snap Mare or do another move, just pick 'em right back up again and repeat and they will do a Body Slam next. This is what makes some wrestlers so effective in this match. As stated above in Section 3, Animal is particularly dangerous because he doesn’t have another move if he performs this pattern, it’s always a Body Slam. Be wary of reversals near the ropes. While it depends on the moves you do, a reversal can lead to a Back Body Drop or Body Slam that could send you flying out of the ring and be eliminated. Ways to win: Pin (you can also pile onto a pinned opponent), Submission, or throw an opponent out of the ring. 1. When slugging it out with the CPU, hit him with a Punch and step back. Repeat this and after the fourth Punch lands it will always knock your opponent down. 2. When in the Royal Rumble and it's down to just you and two CPU opponents (sometimes this can work against four CPU opponents), they will not touch you and fight it out between themselves if you go to either the top or bottom of the ring and run back and forth. Keep rebounding off the ropes as they will walk back and forth trying to follow you but never actually engaging you, they will always engage each other. This is a great trick to heal a little damage while letting your opponents continue to hurt each other. But make sure you keep track of the timer, if it runs out, you all lose. 3. Having more money than the opposition will always give you the win no matter how good they are at this game... BANG!!! Watch all the WWF Wrestlefest excitement here! "Come to me my Warriors!" I agree, one of the best arcade games ever and definitely the best wrestling video game ever! Great write up! I spent many days at 7-11 dumping quarters into the game. Been thinking what I should put into an empty 90's Midway cabinet I have. This may be what goes in it! Nice! 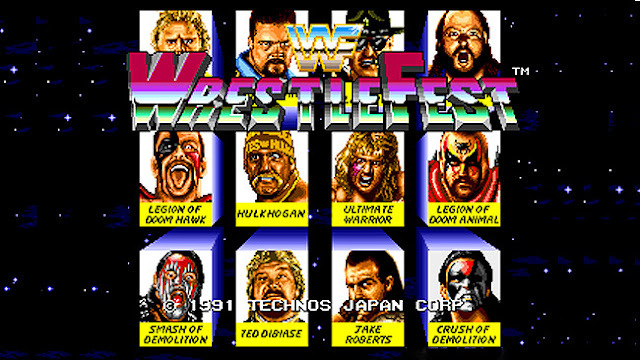 Wrestlefest was the best wrestling video game ever. Even today, nothing comes close. After band practice, a couple of us would head to Wal-Mart before the basketball games to waste a couple hours playing this game. Get an Icee from the Snackbar, set it down, and throw down. Man those were some good times. "When we get done with you two, it's going to look like we set your face on fire and put it out with an axe!"